Grubs in the soil can present a problem when new grass seed is developing. 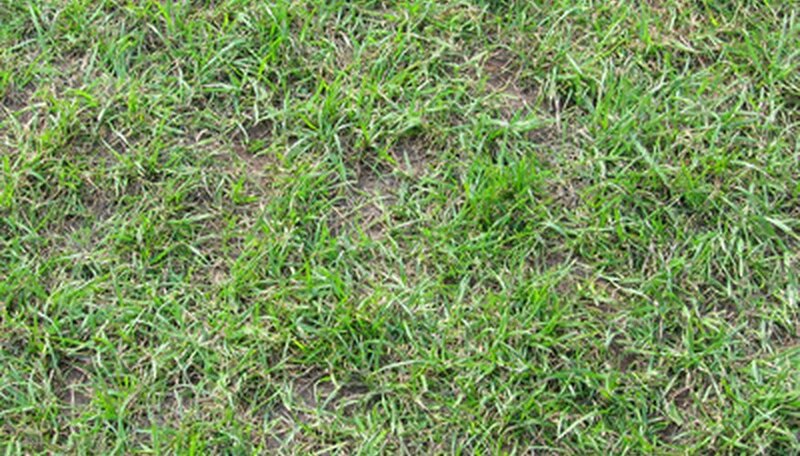 Once grubs populate an area of soil, areas of the lawn begin to turn brown. By that time it is too late, and the only option is to remove the grubs and plant new seeds. According to Landscape-America, grubs do most of their damage in mid-summer, which means that new grass seed may not survive that period. Grubs are small beetle larvae that emerge from their eggs, which are laid in the soil between late spring and early summer. The beetles that produce grubs belong to the Coleoptera order. The typical grub is white, less than 2 inches in length and curls up its body into a C shape. Grubs feed on grass roots, and new grass seeds will not stand a chance of developing into strong, mature grass if left to the mercy of hungry grubs. Mature grass also faces a tremendous challenge when grubs begin to feast on its roots, but if the grass is well established and watered regularly, it may recover. New grass does not have an established root system, so if the first roots are feed for the grubs, the new grass will not survive. If the lawn has brown spots of grass or balding areas, it is possible that these lawn conditions are caused by grubs. Prior to planting new grass seeds, remove any grubs from the soil. An easy way to confirm a grub problem is to turn over the soil 3 inches deep to expose any existing grubs or eggs. If they are discovered in small amounts, manually remove them from the soil to halt the continuation of their life cycle and reproduction. Natural soil treatments for grub control generally affect only grubs and not the surrounding soil. Once the grubs are inhibited from growing and the new seeds take root, then the seeds will develop into mature grass. Natural controls that prevent and treat grub infestations include frequent watering and lawn aeration and adding "beneficial nematodes" and bacterial milky disease to the soil. The grubs will consume these microorganisms, which will then destroy them from inside. According to the University of Rhode Island, chemical controls for grubs change every year, and what is recommended today may be out-of-date tomorrow. New products for controlling grubs can be found at garden and landscape retailers. Since chemicals can have an effect on emerging grass, it is best to deal with the grub problem first before planting new grass seeds. The chemical product may suggest a specific time frame for planting new grass seeds around its application schedule.